Ready to raise awareness about UCP and make a difference? You can host a fundraiser at your office, at your country club, have a tea party or run in a race. You can also fundraise online through sites like Crowdrise or Razoo. Pages can be created by those who are looking to participate in events, such as marathons, or those who just want to share the experience with UCPIE. The support of individuals like you helps us to provide education, advocacy and support each day to people with disabilities. Thank you for your time and commitment to our shared care. 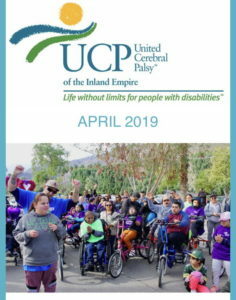 For assistance on hosting a fundraiser for United Cerebral Palsy of the Inland Empire, please contact Nancy Sanders at 760-321-8184 X101 or email at nancy@ucpie.org.